Base tour is calculated for 11,12 days. 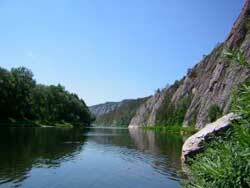 Rafting down rivers of Ural – it’s rafting over the most beautiful places - banks, let germinated by pines, the steep rocks amazing with the power, a rainbow from water splashes… Have ever seen something more beautiful? 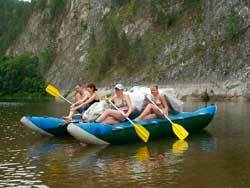 And even You have never taken part in rafting – Bealaya river is very easy-to-start route. Also the route includes visit to some caves – Mindigulovskaya, Kapova – with draws of the primitive human-being. In case of 12-days route – one day can be used for day-rest or rafting in slower rate. Rafting up to mountain Mayak (18 km). Watching grottoes of the rock Columns. Preparation of the place for the rest near Mayak mountatin. Excursion to the mountain. Rafting to the rest-place “Glade of fairy tales” (14 км.). Rafting to Ishdavletovo village. Watching rock “3 brothers”. Rafting to the place Irekle not far from Mindagulovo. (10 км.). Rafting to island Lipovy (22 км.). Fishing.Visit to Mindigulovo cave. 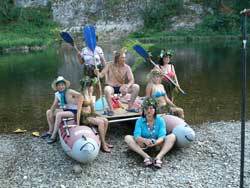 Rafting to Akbulatovo village (8 км.). Survey of the rock “Throne” and of a vertical grotto, rock "Wild boar-tash". Day of rest Visit to the cave of «Fairy tale». Rafting to the Kapova cave. Returning to the base Malinovka. Faraway dinner, sish-kebab. * The program can be changed because of weather terms and level of group readiness. The standard: at the route tourists put and remove tents, cook food. The instructor helps to make all it correctly. Price includes: meeting and seeing of in Beloretsk railway station, all transfers inside the route 3-times dining equipments and horse rent, service of the instructor, sauna. 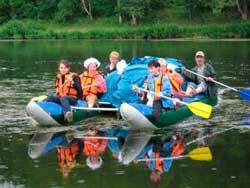 “Service Comfort” – instructor put and remove tents, make fire, prepare wood, catamaran assemblage – 200 RUB/person per day. Age of participants: children under 14 years old – with parents only! 11 дней - 9800 rub/pax.